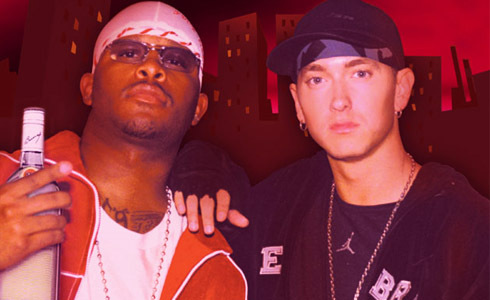 *Eminem and Royce da 5’9″ are back in the studio together more than a decade after the Detroit rappers first joined forces. The pair, who met at a concert in their home city in 1997 and worked together under the name Bad Meets Evil, announced Monday that they’re coming out with an EP of new material in June, reports the Associated Press. According to a news release distributed today by Interscope Records, the rappers pursued solo careers after their initial work together and became embroiled in a feud. In the years since, Eminem’s career has reached superstar levels with tens of millions of records sold and Grammy and Academy Award wins. Royce da 5’9″ also has seen success, but on a much smaller scale, with three of his albums charting in the R&B/hip-hop category. The two mended fences, however, following the shooting death of their mutual friend and fellow rapper Proof in 2006. The new material will be released June 14 on Shady/Interscope Records. Mr. Porter, who is a member of Eminem’s rap group D12, was a producer on the EP. And, for the record, Royce da 5’9″ is the Bad half of the duo, and Eminem is the Evil.